As you struggle through the recent death of your spouse/partner, there may be other losses hovering in the background, influencing your current mourning process. Former losses can include the death of a parent/s or anyone else significant in your life. So what? you may ask. That loss is over and done with. Why should I think about it now? - The length of time it takes you to mourn his or her death. - Your experience of puzzling or frightening reactions that don’t seem connected to your current loss. 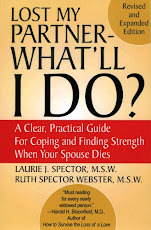 - How complicated the mourning process for your partner becomes. 1) The ways you’ve observed family members mourn a past death has given you (rightly or wrongly), a blueprint of how to grieve. Was it important in your family and/or culture to appear “strong” and unemotional? 2) How did you yourself mourn those earlier losses? Was your grieving process cut short by circumstances or your own attempts to “get over it” too quickly? 3) If a prior death occurred recently, you may feel too overwhelmed by the additional trauma of your current loss to adequately mourn either death. By becoming aware of these hidden issues, you'll gain more confidence over some of the puzzling reactions that may be complicating your ability to mourn for your partner. In our next post, we’ll look at some important questions you should ask yourself to better understand the impact of past losses on the here and now. I lost my wife on May 27th then my Dad lees than eight weeks later. I was so involved with grieving my wife's loss that I didn't have much reaction (except for indecisiveness) for my Dad until the day of the funeral. The day of the funeral I was a basket case. Nobody really knew what was going on with me except my sister-in-law who said it was "way too close"
Experiencing multiple losses, especially so close together is overwhelming. It's difficult enough to process one loss, let alone two. With both your mind and body on "overload" it's understandable you've felt like a basket case. Your reactions are actually normal, given the situation. Give yourself permission to grieve each loss in your own way and in your time. Try to be patient with yourself. Take care of yourself and please stay in touch.